Roof removed, one grandstand leveled – there you have the current situation in Toluca. But the famous Mexican Bombonera is changing almost every day, as you can now see at StadiumDB! When you think “La Bombonera”, your first image is likely Buenos Aires. When you think “Red Devils”, you’re probably around Manchester. But in both cases you may as well think Toluca, because both these nicknames have strong roots here too. The stadium with two World Cups and reputation for great atmosphere is now being expanded by 8-10,000 seats, to reach 30,000. Three stands will see structural upgrades, while the western Tribuna del Sol (the uncovered terrace known for its atmosphere) will be built from scratch with as many as three overlapping tiers. Currently it’s leveled, but a structure 2,000-seat larger than the old one is about to be built within just a few months. 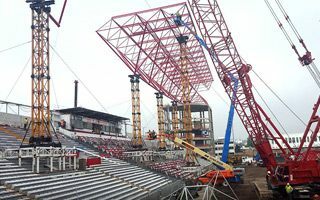 Toluca FC are planning to add VIP towers in the corners, almost copying those from Avellaneda in Argentina. Each pavilion will have 6 floors and also serve as footing for the new roof. Initially envisaged as traditional thick trusses, the final roof structure will be created with over 4,000 thin bars, spanning 115 meters without any obstructed views known from the old stadium. The lightweight web of red steel is created with patented ORTZ system by Lanik. The company used it previously in several famous stadiums, including Arena Pernambuco and Arena das Dunas in Brazil or Estadio Anoeta in Spain. In this Mexican project Lanik will create a solid roof of 10,607 m2, for the first time covering all spectators at the stadium. Multi-storey car park came as the first phase of this project (groundbreaking in late 2015) and has already been built on nearby plot. Once the stadium is finished as well, both buildings will be connected with the stadium by a pedestrian bridges. The entire project is expected to cost 800 million pesos (even if 1 billion is also surfacing in recent media reports) and is expected to be delivered in well under two years. If reached, this deadline will ensure reopening to celebrate the club’s centenary on February 12. For now Toluca are forced to play away from the stadium as the roof is being assembled where grass used to grow. But the rapid pace of each segment being put together and lifted into place gives hope that the tight deadline will be met. Toluca FC might return home this autumn, but they also have the unique Estadio Unversitario at their disposal as reserve ground.